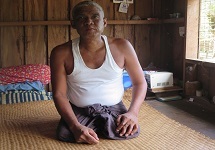 In partnership with Grapes for Humanity Global Foundation, World Education is supporting landmine survivors and persons with disabilities living in Southeast Myanmar in covering expenses associated with medical and rehabilitation services such as shrapnel removal and prosthetics and prosthetic repair. The project also provides beneficiaries with assistive mobility devices such as wheelchairs and crutches. More recently the project has supported World Education's efforts in improving economic opportunities for landmine survivors and persons with disabilities including livelihoods training and in-kind grants to establish small businesses.